There’s a special workshop in Saint-Henri that’s inspiring people to get crafty with their hands. Helios Makerspace in Saint-Henri offers tools, classes, and expertise to help Montrealers build everything from spice racks to electric guitars. Even on a Wednesday afternoon, the workshop was buzzing with activity. Latief Martin, for example, was there to build a bass guitar from unusual materials, inspired by zombie apocalypse comic book series. “In the story, all the weapons are made out of bikes – so we’re creating the soundtrack and live musical performance and all the instruments are made out of bikes,” Martin explained. The space is a cross between a high school shop class, and an incubator for creative projects – filled with every kind of tool you can think of. Klym helps run the non-profit workshop. 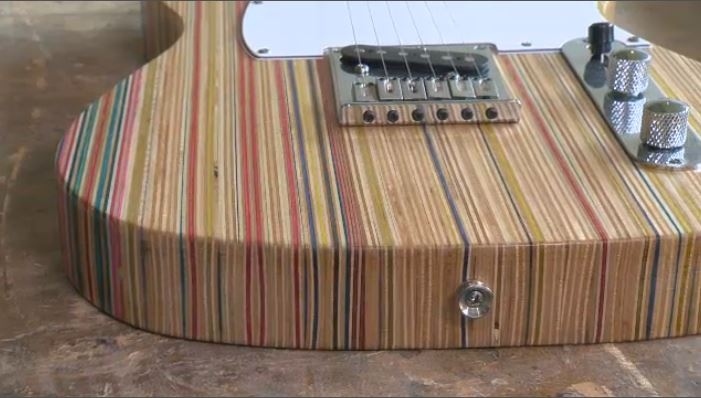 He recently built an electric guitar using wood from 20 different skateboards. You don’t have to have a particular skill to join: membership is open to anyone for 50-75 dollars a month. It launched five years ago by Concordia engineering grads, but professionals use the space too. Paul Neudorf started his own lighting and design company a few years ago. “At some point, I decided that I really wanted to work with my hands more,” Neudorf said. “Honestly without Helios at the beginning, I wouldn’t have been able to start my own company. Alexandre Lavoie crafts and sells his own wooden flutes – some with intricate carvings. Shawn Fawcett runs his furniture company out of Helios, combining steel with recycled wood, and ultimately saving money on overhead. Helios is growing in popularity, recently doubling its workshop space. “We live in a society where everything is less tactile, things are more digital, and getting your hands dirty and working with your hands is something a lot of people feel the need to reconnect with,” Latief added.